A San Pedro police officer identified as Corporal Alfonso Guy, was shot multiple times while at his home in the San Juan Area. Unofficial reports are that he received gunshot wounds to the head and chest. He is listed in critical condition and was airlifted to Belize City for further medical attention. Police are now conducting an aggressive investigation into the incident, however, the circumstances of Guy’s death are still not clear. According to an unofficial report, at about 12:30AM, Guy was inside his apartment/room located in the San Juan Area along with a friend. His friend began playing with Guy’s black Bersa Brand .9mm firearm and allegedly pulled the trigger causing the firearm to go off, causing the fatal injuries to the officer. San Pedro Police have detained two persons following the shooting death of one of its own, 51-year-old Corporal Alfonso Guy. The investigation revealed that shortly after midnight, Guy was with his friend in his room, a young gentleman, who was playing with his black Bersa Brand .9mm firearm, and allegedly pulled the trigger, causing the firearm to go off, inflicting the fatal injuries to him. Further investigation led to the arrest of two suspects, the person who allegedly pulled the trigger towards Guy, and the person who helped retain the firearm used in the incident. “We were also able to recover the firearm used in the incident,” he said. 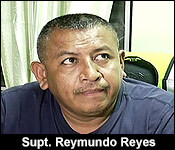 Reyes added that Corporal Guy was a well-known and respectful person in San Pedro Town, who had been an officer on the island for over four years. A 51 year old police corporal posted in San Pedro Town was killed early this morning in what can only be described as bizarre circumstances. 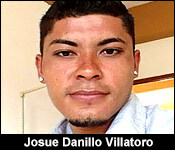 He was killed with his service weapon inside the police barracks in San Pedro while he was socializing with a 25 year old Honduran waiter - whose name police have released, he is Josue Danillo Villatoro. And, he is also the only witness to the fatal shooting in which he is the main suspect. He says it was an accident, but police are treating it as a murder investigation. The entire San Pedro police formation got an early wake-up call this morning when they responded to the shooting of one of their own. 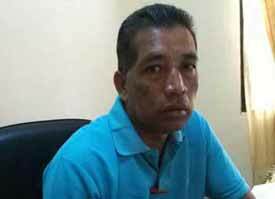 At around 12:30 AM, 51 year old Alfonso Guy, police corporal attached to CIB, was shot once to the abdomen. Today, commanding officer for San Pedro police gave us an interview in plainclothes - indicative of the long hours they've spent dealing with this matter. "Information is that shortly after or before 1 am, a police officer who lives beside him heard what appears to be a gun shot. A few minutes after he made checks and he heard the person inside the room asking for help, so he managed to push open the door. 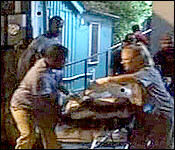 That is when he saw the corporal in a faced up position holding his stomach with a towel trying to stop the bleeding." 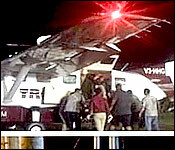 Corporal Guy was rushed to the Poly Clinic and later airlifted to Belize City before day break this morning. But despite best efforts from police and medical personnel, he succumbed to his injuries sometime after 2. Quick work from San Pedro police led to the detention of two individuals. 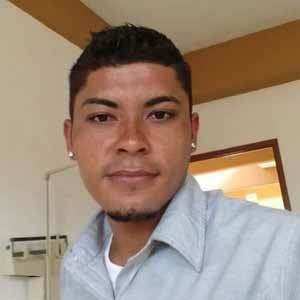 The one suspected to have pulled the trigger is a 25 year old Honduran waiter of San Pedro town. 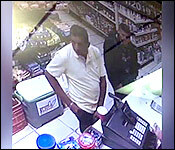 In this surveillance footage, believed to be one of the last public places Corporal Guy was seen alive, he and the suspect are seen purchasing some items at a local store - including beer. After Guy paid, they walked out of the store together. 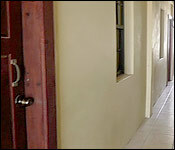 And made their way to the Police Barracks in the San Juan area of San Pedro. Both men had been socializing from earlier in the day. But around midnight they came here, at Guy's living quarters. "And this person that was in his room had other police officers, friends of his seen him with this person before? What is his relationship like with this person?" "The person who was with him socializing is someone who is known to police. It is not a stranger to the corporal neither. It is a friend. But, like how we said, he is giving us a story and we are looking at that alibi." The story he is telling police is that while inside the room he began to play with the Corporals .9 mm pistol when the gun went off; a freak accident. But despite the suspect's candor, he implicated himself when he bailed from the crime scene and attempted to rid himself of the smoking gun. "The person fled the scene. After the incident nobody else was seen. When the neighboring officer found him he was in his room by himself. There was nobody else. The police did not get a phone call saying that by accident something happened there please go and assist, nothing to that effect." "Sir, if the storyline that this person is presenting police proves to be the truth, what charges could he be possibly faced with?" "What we are doing is that the case file or whatsoever we have on hand will be sent to office of the Director of Public Prosecution for advice. We cannot say; we are investigating it as a murder investigation right now but we will seek legal advice from the but we will seek legal advice from the Office of the DPP whether we should proceed with a charge or with what charge we should proceed." "And when he bailed from the room he went with the gun as well?" "He took the gun with him." Now the entire police department are left to mourn the death of 51 year old police veteran who can only be regarded by his colleagues as a cool and humble guy. 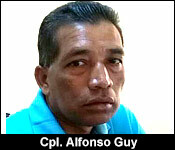 "Alfonso Guy is a person whom we could say is well known here in San Pedro. He is a senior police office with vast knowledge and experience. A person that you could say you could talk to, cool, respectable and if you need any help he is there for you. It is not anybody that you would say is an arrogant individual. He is a very cool gentleman." The second person in police custody is the one who attempted to aid the main suspect in getting rid of the firearm, which was discovered in his possession. Our reports say Josue Danillo Villatoro has confessed to shooting Corporal Guy accidentally. And while the investigation continues, police have reached out to Corporal's family in Corozal to assist them with funeral arrangements. He becomes to third police officer killed by a gun since November of last year. On Saturday, January 12th, San Pedro Police formally arrested and charged 25-year-old Honduran waiter Danilo Villatoro Amador, for the crime of murder after the death of Police Corporal Alfonso Guy. 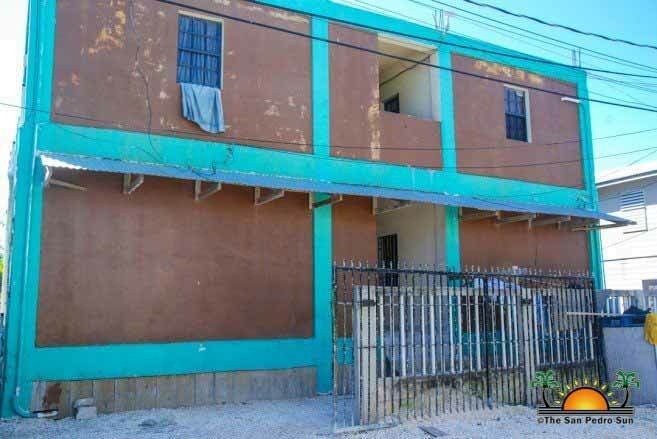 Guy was fatally shot in his barrack room in the San Juan Area during the early hours of Friday, January 11th. He was initially treated at the Dr. Otto Rodriguez San Pedro Polyclinic II and then airlifted to the Karl Heusner Memorial Hospital in Belize City. He succumbed to his injuries while being transported to the KHMH.